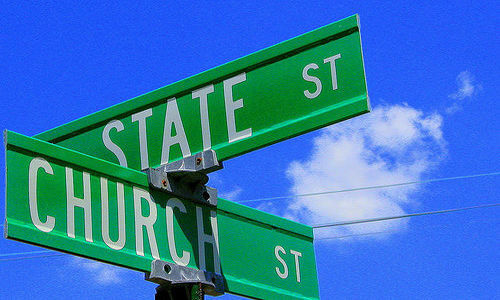 One of the biggest deceptions that have taken place in the United States is the issue of the separation of church and state. It has led to crosses being torn down in public places, nativity scenes being forbidden on public property, prayer eliminated from school functions, and those ending in Jesus’ name are totally forbidden in government meetings. The list extends even beyond these areas. For instance, the ACLU brings lawsuits against school districts to keep any form of Christianity out of the schools. The “Freedom from Religion” organization is just as evil (Ephesians 6:12). Even so, the Constitution does not prohibit public displays of faith. At its ratification, the early republic welcomed public worship even in its government buildings. Anyone who has been to Washington DC and toured the government grounds cannot do so without observing the biblical images on the buildings. They clearly bring forth a message. In the Constitution, these words appear: “Congress shall make no law respecting an establishment of religion, or prohibiting the free exercise thereof.” The intention was for two reasons. First, it was intended to limit the power of the federal government by ensuring that it would not establish a state church. Secondly, the government was not to prohibit the free exercise of religion. Tragically, this amendment is being deliberately misinterpreted today and is used by the ACLU and other atheistic organizations to try and separate God from the government. Therefore, whenever any Christianity is exerted in government agencies or in the public square, these groups cry out, “This goes against the separation of Church and State.” The next step is that they threaten to bring lawsuits if it is not stopped. People, totally ignorant of what the Constitution says, bow to their threats. All of this is leading to our rights slowly being taken away from us as citizens of the United States of America. Unless it is stopped by voting in people who truly recognize what our Constitution says, including any President, this country will continue its slide downward. Eventually, Americans will not be able to do anything without government interference. The United States will no longer be the land of freedom. When the Constitutional Convention was deadlocked and it seemed as though it might be dissolved by disagreements, Ben Franklin called the delegates to prayer. The founders, also, warned that America would lose its liberty if it did not honor God. Is this still happening? Only “righteousness exalts a nation” (Proverbs 14:34). The Bible also says, “When the righteous are in authority, the people rejoice; but when a wicked man rules, the people groan” (Proverbs 29:2). Are many wicked ruling in different areas today? With the degrading of morals and accepting of godless actions in the public square and in politics, the question is not too hard to answer. Therefore, people who know the truth must faithfully point out the wrongs and the errors and stand for the high values that America was founded upon.